Ida Saxton McKinley (June 8, 1847 – May 26, 1907), wife of William McKinley, was First Lady of the United States from 1897 to 1901. She was born in Canton, Ohio. Her father was James A. Saxton, who was a famous banker. He educated Ida and their sister well. After their schooling, they went to Europe on a tour. She started to work as a cashier in a bank. In 1867, Major William McKinley came to Canton to start his work as a lawyer. Ida and William McKinley came to know each other, and they fell in love. They married each other. While her husband devoted time to his work and career, Ida devoted time to her home and husband. She had a daughter on the Christmas Day of 1871. They named their daughter Katherine. She bore a second daughter in April 1873. At that time Ida was very weak and ill. The second daughter dies in August. Their first daughter also died in 1876. By this time, Ida had become very weak and an invalid. In the meanwhile, her husband has become a Congressman. He them became a governor of Ohio. He always paid his attention to his wife and cared for her. She spent most of her time in a small Victorian rocking chair. This chair was with her since her childhood. When they entered the White House, Ida’s health was very weak. She took the role of the First Lady, but while seated in a blue velvet chair. She sat by the side of her husband during official dinners. The President kept a careful watch on her condition. At that time, very few people know of her bad physical condition. Only in recent years, people came to know of her bad physical condition. 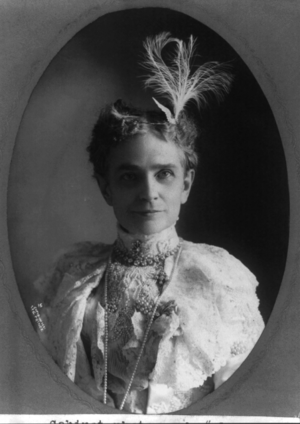 After her husband’s death, Ida Saxton McKinley returned to Canton. Her younger sister cared for her. She visited her husband’s grave almost daily. She died in 1907. She lies buried by the side of her husband and their two daughters in Canton’s McKinley Memorial Mausoleum. Ida Saxton McKinley Facts for Kids. Kiddle Encyclopedia.